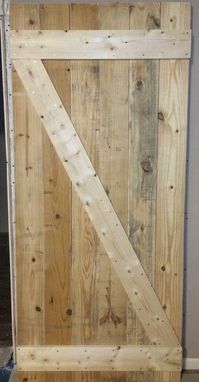 Unfinished Knotty Pine Barn Door. We created this knotty pine barn door for a client who wanted to finish it themselves. The bard door was custom made to their specifications using pocket hole construction and finished with round head nails for aesthetics. We can make you a barn door in any dimension you would like out of FSC lumber or reclaimed. Consultations and renderings are free of charge.